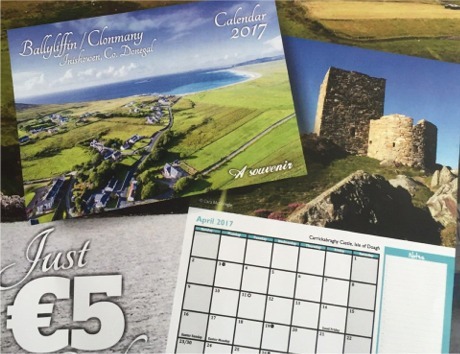 BALLYLIFFIN Tidy Towns committee has just released its beautifully-produced calendar for 2017. The ‘Discover Ballyliffin/Clonmany’ Calendar has twelve stunning photographs of beautiful Inishowen. The photographs are the work of local photographers Annette Porter, Rory Porter, Ann McGonigle, Jay Doherty, Catherine Dillion, Cara McGonigle (age 12) and Caroline Grant. The Discover Ballyliffin/Clonmany Calendar 2017. It was printed locally and is available for sale at €5 from Centra, Londis, Clonmany Post Office, Nancy's Barn, Glendowen and all the hotels. "This is a 100% local production and is an ideal gift to be posted around the world to your family and friends - please support us," said a spokesperson. 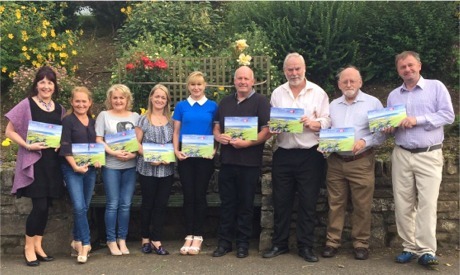 Members of Ballyliffin Tidy Towns with copies of their 2017 calendar. The Tidy Town committee also thanked its sponsors: Clonmany Festival committee, Glendowen Craft Studio, Atlantic Stores, Rashenny National School, Inishowen Car Dismantlers, Ballyliffin Hotel, Ballyliffin Golf Club, Ballyliffin Lodge, Strand Hotel, Ballyliffin Town House, Devlin’s Garage and Nancy’s Barn.